Investing is a great way to begin building wealth and securing your financial future. 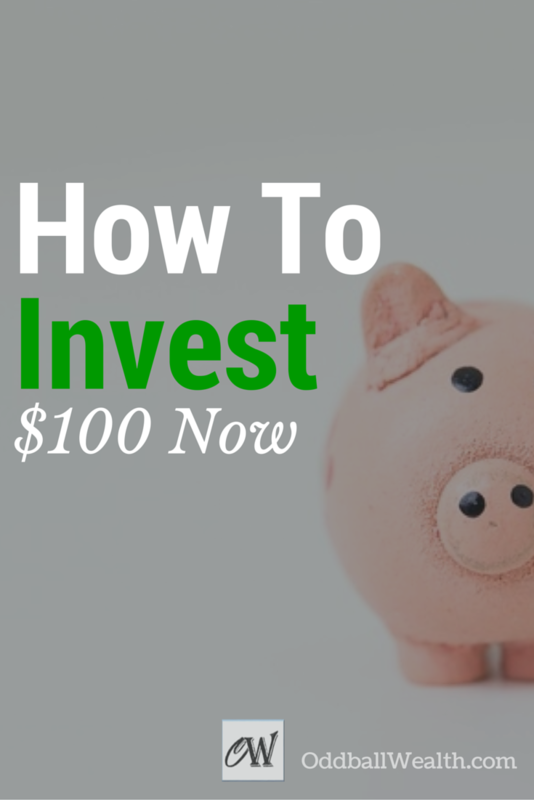 You don’t need a lot of money to get started, and can start investing with as little as $100! Your options are more limited than if you had $1,000, $10,000, or even $100,000 to invest but you still have options! I’ll show you the best money investments for your 100 dollars. Learn where to invest money and how to build wealth with only one hundred dollars. Finding good investments on ways to invest $100 or even how to invest 1000 dollars isn’t easy, but here’s a list of ideas for the best places and things to begin investing in and grow your small nest egg. In fact investing only $100 is far better than investing no money at all. Maybe you don’t have a lot of money but by making the decision to invest as little as $100, it can help you get some momentum going and continue investing. Everyone has to start someone, and believe it or not starting is the hardest part. Before you know it you’ll have more money than most people! I just want to point out that only investing $100 isn’t easy and your options are limited with that amount. Many brokers require account minimums or a minimum deposit greater than $100. Then add on transaction fees and sometimes even annual fees. Those fees alone would leave you with even less to invest, if anything at all. But don’t get discouraged! I’ll go over and explain possible options available to you, where you can invest as little as $100. First, let me make clear what not to invest your money in. Lottery Tickets. Buying lottery tickets is not an investment, it’s financial suicide. Gambling in General. This includes casinos, poker in your buddies basement, scratch offs, etc. You have a greater chance losing all your money gambling than actually making any. I’m sure you already knew all that, but it amazes me how many people consider buying lottery tickets or playing the slot machines a form of investing, don’t do it! Now on to the good stuff! The following are some of the best investments for people with a small amount of money to start out with. I’ll teach you the best ways to invest money and how to start investing with only 100 dollars! Betterment is an easy to use investment service that does the investing for you. The investments are based on your age, investment duration, goals, and risk tolerance. Betterment does not require a minimum account balance. There’s also no transaction fees, trade fees, and no rebalancing fees! Making Betterment a perfect candidate to invest your $100 with, and it is also why it’s number 1 on our list! The fees they charge are much less than what similar services charge. You’re not required to have money auto-deposited into your account, but if you do auto-deposit of a minimum of $100 a month in your Betterment account they only charge 0.35% fee. Lending Club is a peer-to-peer lending service. You make money by lending your money to other people and they pay you back with interest. You can begin investing with Lending Club for as little as $25 and with no minimum account requirement. You can also make some pretty decent returns on your investments with Lending Club. If you’re new to investing with peer-to-peer lending, it’s smart to be cautious at first and not invest all your money into it right away until you’ve played around with it a bit and understand it more. OptionsHouse is an online discount stock broker. They have a flat rate of only $4.95 to trade stocks and ETFs. Currently they do not require a minimum account balance. OptionsHouse is a great option for individuals who want to invest in stocks with only $100 to invest! Firstrade is an online discount broker with similar services as OptionsHouse. Although Firstrade is a bit more expensive at $6.95 per stock & ETF trade. Invest in yourself by educating yourself further on investing and creating wealth! Easily do this with online courses and classes! 360training.com – Here you can choose from over 6,000 online courses to take, so you’ll be sure to find one that fits your interest. The best part is they also offer free courses! Continuing Professional Education – Use code “CPA20” and receive a 20% Discount! Get Unlimited CPA/CPE Continuing Education! Healthcare Courses for Dental Professionals, Respiratory Therapists, Radiology, etc. Food and Beverage Certification Courses – Get 10% off these course by entering code “L2SAFF10”! Certificates of deposits, also called “CD’s,” are like savings accounts, except they generally earn you higher interest on your money, and you agree to keep your money in the account for a certain period of time. BBVA Compass, a leading U.S. banking franchise, which is ranked among the top 25 largest banks, has 688 physical branches, and is also known as one of the best online banks, currently has some of the highest yielding certificates of deposit accounts. If you’re considering putting your money into a CD, I highly recommend you check out their 13-month CD and 23-month CD, as they offer higher rates than most banks and give you a higher return on your money. Many studies reveal that rich people generally all have one thing in common, which is they buy and read a lot of books. No, they don’t read books like Harry Potter or Trigger Warning, in fact they don’t buy very many fiction books at all. The rich buy and invest in books that give them knowledge, which they can then use that knowledge to make them more successful and more money. Invest your $100 in books that will educate you, and begin building your own library of self-development books that will help you succeed and grow as a person. Successful billionaires like Bill Gates and Warren Buffett are perfect examples of individuals who started out building their wealth by purchasing and reading books that gave them knowledge. One person I truly admire is Robert Kiyosaki, who is the founder of the education company Rich Dad Company, and the author of some of my favorite books like Rich Dad Poor Dad, The Cashflow Quadrant, and the Real Book of Real Estate, and he also agrees that books are one of the best investments you can make. Do you know what passive income is? Well here’s an awesome book about it! The best part is you’ll still have $91 to invest with. If you don’t have credit card debt, then put that $100 towards other debt like your mortgage. By doing so, you’re guaranteeing yourself a 100% return on your money! Ever wonder how banks make money? They make the majority of their money by lending money to consumers and the interest borrowers pay on that money. You can make money lending money too! Companies like Lending Club allow regular Joe’s like yourself make investments by lending money to consumers, and make money on the interest they pay you as they pay back the principle. You could invest some of your hundred dollars into a side hustle to make more money. The best part about side hustles, or side business, is they require very little money or no money at all to start! There are many different side businesses you could start and begin. If you need some ideas, check out this list here of the most profitable ways to make money online. My personal favorite side hustle is blogging, and starting a blog was one of the best decisions I’ve ever made. Starting a blog is rewarding in many ways. The first way of course is that you can make a sizable amount of money by having one, but you’ll also learn many new skills, become a better writer, share your knowledge and passion with your readers, and stay relevant in your niche. You can easily start a professional looking blog and get a free domain name for only $3.49 on Bluehost. What’s even more awesome is you’ll still have $96.51 left over to invest! If you’re interested in starting your own blog, I’ve written a couple different guides to help you get started! Invest your $100 by purchasing a couple silver coins. It’s a simple investment that could set your wheels in motion for other forms of investing in the future, and spark your interest about the markets and commodities. Silver has been used as a currency and investment since the beginning of human existence. It’s a precious metal used in a variety of things, and there’s only a limited supply of silver on our planet. Silver is also considered a “world currency,” meaning it has value in all parts of the world. You can purchase silver dollars and other silver coins, while finding the lowest price on websites like Amazon, BGASC, Money Metals Exchange, and Golden Eagle Coins. Love this article! So does anyone know of something like Lending Club that you can take part in if outside the United States? I did a little research and found a couple articles that might help you! Where can we find international-peer-to-peer lending sites? What about non Us resident? i am from serbia. can i invest in betterment?